Murph is an American backyard wrestler formerly of Backyard Championship Wrestling (BCW), Northeast Championship Wrestling (NECW), and Jersey Wrestling All-Stars (JWA). He is a frequent guest wrestler for IWC in Norwalk, Connecticut, travels often to shows throughout the Northeast, and is the leader of the Pride of the Northeast faction. Murph is the current holder of the GBYWN World Heavyweight Championship, winning the belt from Joe Randa in August of 2011. As of August 16, 2012, he has become the longest-reining champion in its history. 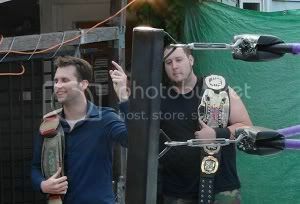 In honor of his second home fed, Murph uses the NECW Championship as the current GBYWN title. JWA 2- JWA Championship Match - Matt Demorest (c) vs. Murph Music Video. JWAvideos. Released on June 24, 2009. NECW Pro Access Wrestlefest Music Video. NECWrestling. Released on May 02, 2009. NES3: The Perfection (BKW) vs. Murph (NECW). backyardkamikaze. Released April 06, 2009. This page was last modified on 18 August 2012, at 20:59.